Momofuku (literally translated as Lucky Peach in Japanese). What a name! I’ve heard of this David Chang‘s chain of restaurants but unfortunately can’t go all the way to the states to taste! Bless the food bloggers that has been sharing his recipes, people like me get to recreate the dishes and enjoy them. One of the most widely popular recipes, ginger scallion sauce has been referred as the ‘mother sauce’ of Momofuku, is nothing more than a combination of ginger, scallions, oil, and seasonings, but boy isn’t it amazing sometimes what something so simple can taste so good? 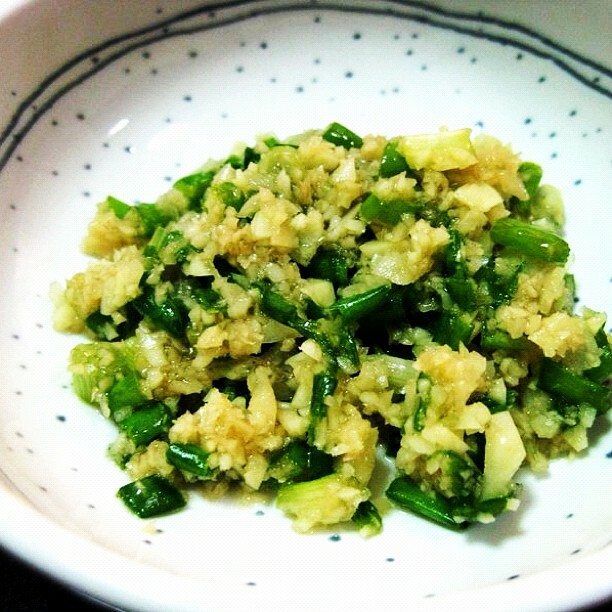 Mix together the scallions, ginger, oil, soy, vinegar, and salt in a bowl. Taste and check for salt, adding more if needed. Though it’s best after 15 or 20 minutes of sitting, ginger scallion sauce is good from the minute it’s stirred together. Use as directed, or apply as needed. My version of the sauce is a little heavy on ginger because the bunch of scallions I bought was pretty small. I will try it with the right ratio next time though this already tastes damn good! It can last up to about 1 week in the fridge, though you can also freeze it. I’ve used this to for plain egg noodles, garnish on Gyu tataki, and many more dishes. It’s quite versatile and add so much to the food! 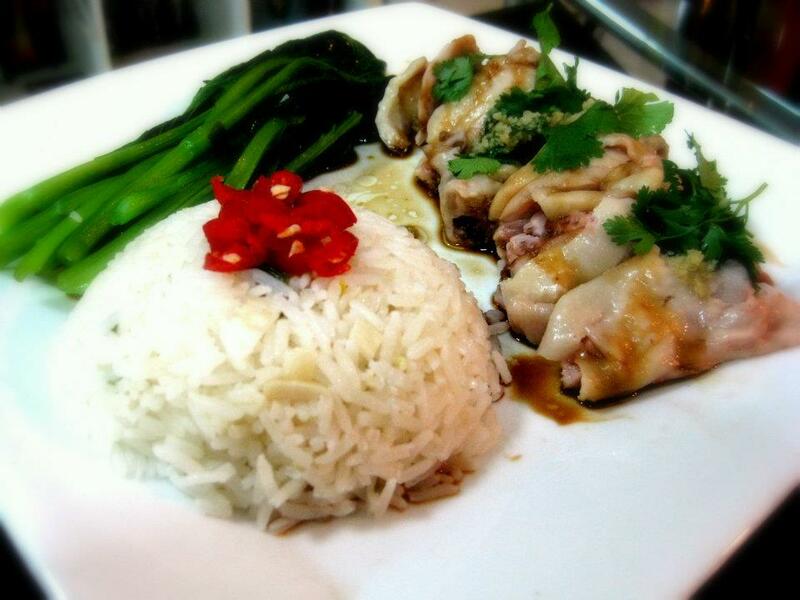 And this is my lazy version of chicken rice, because why cook a whole chicken just for one? Bring water in a pot to a boil and turn the heat down, add half a tablespoon of ginger scallion sauce, and garlic, then put the chicken drumsticks in and poached until it’s done. We don’t want it to be overcooked so the trick is when you stop seeing fresh blood at the end of the drumsticks, and then add about 1 minute. Once it’s ready, take the drumsticks out and put into ice cold water bath to stop the cooking process and tighten the skin. Chop it up or serve whole. Use the remaining broth, measure out accordingly for the rice. (1:1) Fry garlic and ginger in the pot (I used sesame oil but chicken fat would be best!) and then add the rice. Cook til the water’s all absorbed. Put the dish together, garnish with choy sum and chili, and also the remaining ginger scallion sauce on the drumsticks, really as much as you want. So, what other combinations can you think of with the Ginger Scallion Sauce?? Mmmm. Would be nice with pork! How do we know the mother-loving chicken was lazy?